This is Patrick and Doug's podcast. They have to defend it. Regarding Jennifer Rubin, the relationship is going great. 1 month strong. She only hangs out with other Rubin's though so now I see Paul Ruebens, Gloria Reuben, Saul Rubinek and Ruben Blades all the time. She also eats a lot of Reuben sandwiches so our place reeks of thousand island dressing and sauerkraut. I saw Home Alone when I was 8 and then my family went to Walker Brothers afterwards and I sort of took a mental snapshot like 'GREAT NIGHT'. At 30, I am still as easy to please. Ok, I am one of the people who likes Jingle All The Way (ironically), I also LOVE (very much ironically) Christmas With The Kranks and Deck The Halls. During the Holiday DVD marathon I have annually with friends these are staples and have become known as 'the trilogy'. All three of those movies are demented, having only an understanding of the commercial aspects of the holiday. I don't drink very often but during the trilogy we all do shots of Jaegarmeister every 15 minutes. You get a great nap out of it later and it makes the back leg of the marathon much more enjoyable because you'll hear impassioned defenses of the Santa Clause 2, Jack Frost (w/Michael Keaton), Eight Crazy Nights or the HeMan-Sheera Xmas Special. Ugh. Easily one of the worst of the John Hughes movies, with one GEM of a scene in the middle (the truck scene with John Candy) that can stand up with the best of Hughes' work. Odd recommendation from me, left over on my DVR from October: Lobos de Arga (Game of Werewolves). It's a Spanish horror comedy in the Shaun of the Dead mode and remembers one of the Shaun lessons that if you're going to do a horror comedy you need to work on the horror as much as the comedy. Well acted and directed with some very nice action pieces and some very legitimate comedy. Not on DVD over here so you might need to keep an eye out for it on HBO. Still, thank you for revisiting it and talking about it! This podcast provided a great trip down memory lane. I haven't listened to this yet but my first impression is, ugh, what a shame the WORST month for holiday-related movies comes so closely after the BEST month. Granted I am looking forward to watching It's a Wonderful Life for the first time and Scrooged is pretty awesome, but other than that and Jaws 4: The Revenge it's pretty bad. I have not listened yet. I just got home from work and saw it was up, so I wanted to post some quick thoughts before my tone is potentially swayed one way or another by what is said in the episode about it. I can see you guys not liking it as adults. As for me, I'm way too close to this movie to be objective. For whatever reason, I thought this was one of the greatest movies of all time when I saw it. I watched it even when it wasn't Christmas time for a couple of years. It was one of my first VHS tapes. 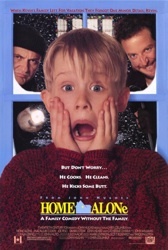 Since rediscovering it about 5 years ago, I've watched it every year since, and now our kid loves it too because SHE KNOWS how awesome it is to be a kid home alone. I know the movie is not great, but I now associate it with my childhood, bubble gum, sunshine, puppy dogs, and a world without death. Whatever it actually is or isn't, it's now in the nostalgia zone, next to Charlie Brown Christmas, which has been scientifically proven to cure AIDS. Wait, this is a Chicago movie! You guys probably trick or treated at that house or something. There was probably a hateful old lady who lived there named Von Hughes who looked an awful lot like John Hughes in old lady drag. Alright, I'm going to listen to the episode, then I'll meet you all back here with more to say. Hopefully my childhood memories won't have their ugly, yellow, no good keisters pumped full of lead. I don't think we'll say anything that will upset you or crush your faith in us. I can't really be objective about the movie, either. I try to say "Ok, removed from my nostalgia, is the movie good?" And we never bother answering, because it doesn't matter. The movie is an institution, and it still makes me happy to watch it. I can't wait to leave my son home alone for a week. You know -- so he'll get all the references. You're right, you guys were way kind to this movie. I mean, it would not have been a big deal if you hadn't been, because we're all different, but I'm glad that you guys fall close to the same place as I do. An institution indeed. And Doug's Alan Rickman impression is awesome. I'd like to think that Alan Rickman is a huge Home Alone fan, and for Christmas he gives all his relatives copies of the movie on blu-ray. He donates dozens of DVDs of Home Alone to Toys For Tots. In conversation with his theater friends, he tries to segue from Shakespeare to Home Alone. "I find the plight of Hamlet to be not at all dissimilar to that of a young Kevin McCallister," and they all just stare at him blankly. They know how he do. Life of Brian! I love this movie. I think every theology student or seminary student should have to watch this movie, because it really takes the piss out of pious people. I've had my fill of piety, legalism, and people like Pat Robertson (hence why I find The Mist hard to get through) and I think Life of Brian is a breath of fresh air. As associated as John Williams is with scores like "Superman," "Star Wars," "Jurassic Park" and "Indiana Jones," his score for "Home Alone" (particularly the chimes during the opening credits) is one of the finest pieces of music I've ever heard him compose: happy, folksy and perfect for the holidays (which I don't celebrate but hey, gifts!). Williams' music is the highlight of the movie, which I've only seen twice because Joe Pesci is in it. Between "Home Alone" and "Goodfellas" 1990 was the year of Pesci, then he became a bomb thrower ("The Super," "Gone Fishin'," "The Private Eye," etc.) with and odd success story every now and then ("My Cousin Vinny") along with the privilege of a "Goodfellas" rerun ("Casino"). Can't believe there's a Snickers commercial on TV now that is only the third thing Pesci has done in the 2000's besides his feature-length Xanax commercial, i.e. "The Good Shepherd." For some reason I cannot download this episode.